It was just as he remembered in his dream; a vision the night before. A large male buffalo stood on a ridge near Slim Buttes, just north of the Red Cloud Indian School campus. Steam rose from the shaggy animal's nostrils in the quiet, frosty-blue luster of early morning on the reservation. Vance Blacksmith stood watching the animal as the sun rose behind it. For a few moments everything was still and quiet. Blacksmith then motioned to Bailey and Chris to ready their rifles. The two high school students had accompanied him and other staff to the pasture. They got into position and took aim. A few weeks earlier, the two had asked the school's administrators to help them bring back the school's annual Buffalo Kill after a two year hiatus. And, they explained to their principals that, as part of their Faith & Justice class, they would use the opportunity as a service project to educate their fellow classmates on the historical and gastronomical connections between Tȟatȟáŋka (the buffalo) and the Lakota people. "When I was a freshman we did this and I really liked it—thought is was really cool," said Bailey. "I've always been a hunter, so I wanted to help do this for the school and get back into our culture." "There are always kids doing recycling, and don't get me wrong, it's a great thing," Bailey continues, referring to other student's service projects. "But this—this is more for us, as Native people." Two hours later, Blacksmith and his crew unloaded the massive, 1,000-pound animal from the back of a truck bed with the help of a Bobcat. Students from across campus began to walk over to the bus garages where they were told they would witness the ceremonial harvesting of Tȟatȟáŋka. As they approached, the elementary students whispered and gently wiggled between their peers to get a closer look at the sacred animal that lay before them. 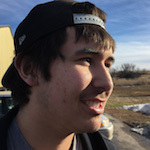 "Students want more cultural activities and events," says Blacksmith, activities coordinator for Red Cloud's Lakota Language Program. "This a step in the right direction; to incorporate more Lakota cultural and language activities into the student's education. It gives the kids a hands on experience to supplement the classroom lessons on language and culture." For many students, this may have been the first time they have been able to witness the sacred act, which had traditionally provided food, clothing and shelter to their ancestors for millennia. "Without the buffalo, there would be no Lakota," says language teacher Roger White Eyes to the gathered students, noting both the Lakota's creation story as well as their intimate societal relationship with the animal. With a prayer of thanksgiving over the buffalo and the hunters, Blacksmith's crew worked to remove the hide that will later be tanned and decorated by Red Cloud's art class before being hung in the school's commons. Next, with their fingers numb from the cold morning air, they began the long processes of butchering the meat that would be given to community members and families. And finally, they removed the skull, that will be washed and used for ceremonies in the school's sweat lodge. While buffalo still roam the reservation's prairie ecosystem, they are designated to specific pastures and kept by the Oglala Sioux Tribe for use by tribal members. However, they are currently not maintained in numbers that could sustain the population. Dianne Amiotte-Seidell is working to change that at the Intertribal Buffalo Council, an organization that is working to increase the numbers and use of buffalo in the region. "We recently donated approximately 34,000 pounds of buffalo meat to nearly 40 tribes," said Amiotte-Seidell. "Our ancestors used to eat buffalo meat and they were healthy for it. It has a lot of great nutrients and it's so lean. None of our ancestors had diabetes or heart disease. And so we work with an Association of Native Americans grant to help our younger generation learn about and use buffalo to become healthier." "This is sacred. This is how it should be done," Amiotte-Seidell notes. "I'm proud of you guys, you're doing it right." 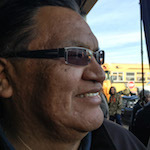 In honor of the Tȟatȟáŋka Ktépi Aŋpétu, (Buffalo Kill Day), the Intertribal Buffalo Council donated nearly 100 pounds of USDA certified Buffalo meat for school lunches at Red Cloud that day—a menu item Amiotte-Seidell hopes to see a lot more of across Indian country—bringing the cultural lesson to fruition. As the ceremonial harvest came to a close, Blacksmith surveyed the bony remains of a hard days work. Touched personally and spiritually he reflected on the event. "I feel happy to see all our kids here watching the process and It makes me feel good. I know we can always improve and I'm glad we are here doing this again, on campus," said Blacksmith. "It's a stepping stone. We've been giving the students language, but they also want more culture. So this is an overall movement we're seeing here today with this buffalo." With the hope of more funding next year, Blacksmith looks to the future and sees students out on the pastures learning more, dancing the traditional buffalo dance and further incorporating the culture into the school's curriculum and educational model.